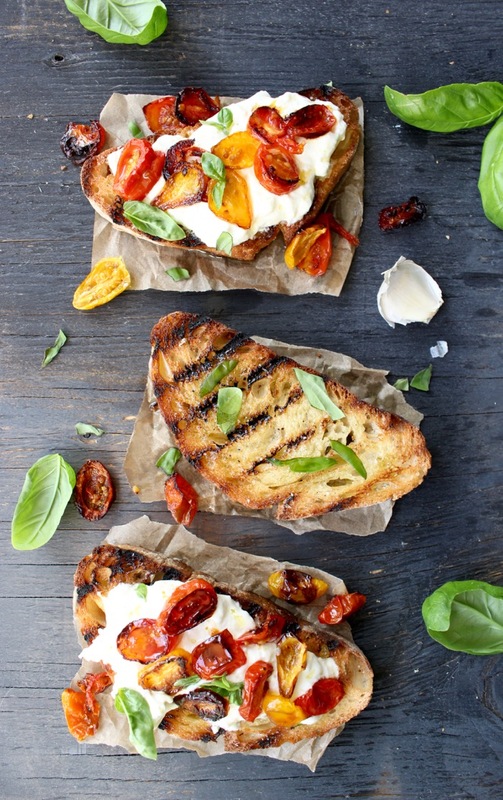 Heavenly Burrata Bruschetta with Oven Roasted Cherry Tomatoes on Crusty Italian Garlic Bread ! 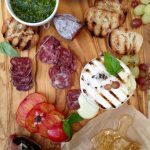 Let’s talk about real burrata bruschetta! The rustic grilled piece of garlic bread that would be my last meal on Planet Earth, If I was asked that question. 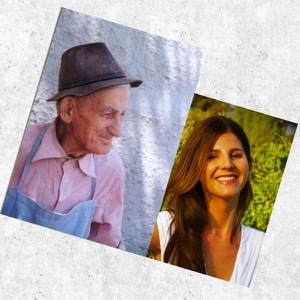 Unless I said that about some other meal on here, in which case I take that one back; unless of course I said the rustic chicken stew over creamy polenta..I probably did, didn’t I…? 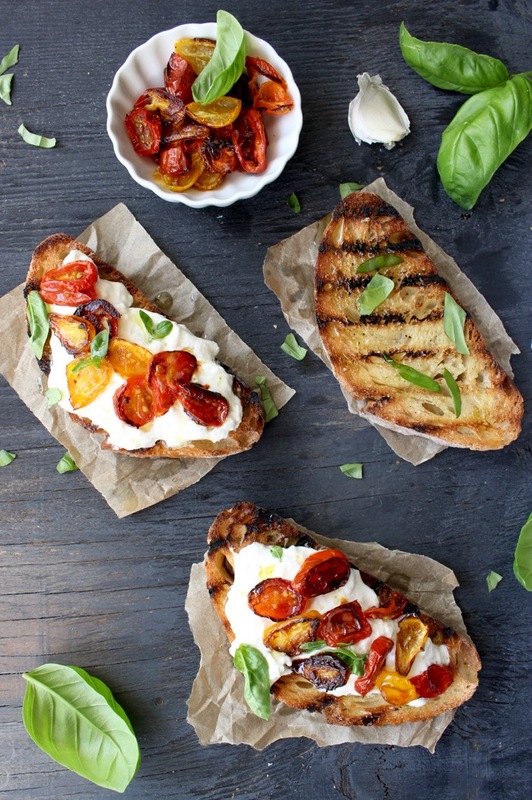 So let me just add this burrata bruschetta to that to make it a meal. Okay, great, because really that would not be a fair choice to make. 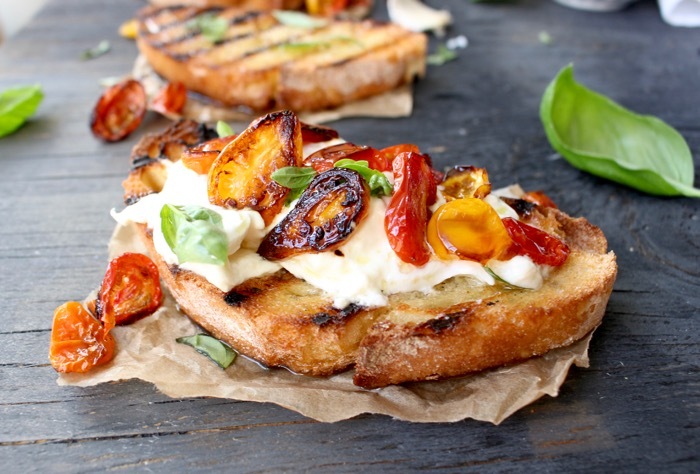 This burrata bruschetta has to be the most rustic, easiest food to make on the entire planet. No kidding, all you need is patience and love. You gotta love your bruschetta, talk softly to it, don’t rush it, let it slowly get those nice grill marks and robe itself in a subtle layer of smoke before rubbing that garlic clove all over the top until it disintegrates. 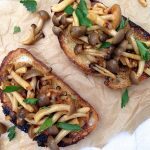 There are many ways you can take a bruschetta, depending on the produce in season at the time. But just know: there isn’t anything as close to godliness as cheese and tomatoes. I made an appetizer bruschetta platter with both burrata and ricotta, it was a tie, no leftovers so how do I really judge this ? 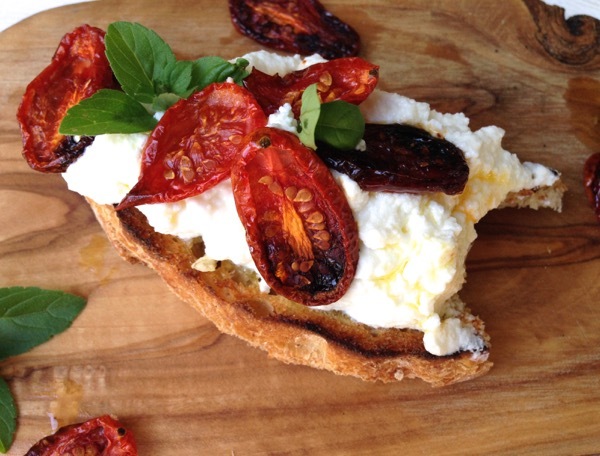 My taste buds are partial to the burrata but I’ll never say no to a ricotta bruschetta. 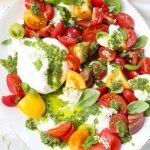 What is burrata cheese really ? 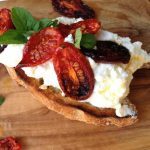 Burrata Bruschetta is the ultimate peasant food, the best rustic Italian garlic bread on the planet: garlic, burrata, bread, roasted tomatoes, pure heaven ! Preheat your oven to 350”F. Meanwhile slice the grape tomatoes lengthwise into 3 slices. Arrange them on a lightly oiled baking sheet, sprinkle with a pinch of sea salt and roast them for about 30 minutes or so until most of the moisture has evaporated and they start to caramelize at the edges. Preheat a large grill pan on medium high flame until hot. Add the ciabatta slices to the hot grill and allow them to charr and smoke a little bit until nice grill marks form all over, about 3 minutes per side. Transfer them to a wooden board to cool, then rub them generously with the garlic clove. Brush one side with the olive oil and season with a good pinch of sea salt. Using paper towels make sure to dry any excess moisture from the burrata cheese. 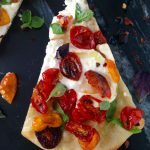 Slice it into thick slices or simply tear it into rustic pieces and divide between the bruschetta. Sprinkle with the oven roasted tomatoes and garnish with the basil. Enjoy right away with a glass of vino. Make sure your grill pan is hot when you add the bread to it, you need this in order for the outside to charr quickly while the inside stays soft. If you add the bread to a cold grill pan it will take longer to charr and the inside will harden up as well. Mmmm OVEN ROASTED tomatoes 🙂 I drool for youu! Marcie ! A girl after my own heart ! There is nothing worse than a super hard piece of bread under all that bruschetta deliciousness! I love the looks of your bruschetta. Now my stomach is growling! I’m such a huge fan of bruschetta. It’s like the perfect appetizer for me – and so perfect for summer! Me too @Kristi , I could have it for a meal every day ! Just want to say this bruschetta is the bomb! I made this for a dinner party tonight and it was a huge hit! Absolutely delicious! Looks so delicious! Can I warm the bread in a frying pan, if I don’t have a grill? A flat cast iron pan will work too, doesn’t have to be a grill pan.